In her 20’s, she was founder, owner and president of a successful Calgary-based insurance agency for over a decade before focusing her attention on building an elite curling team. Cheryl learned early on that by creating a dynamic workplace culture that empowers the team helps flourish business results. She and her staff propelled the agency to 6 Million in sales in 11 years. At that time, Cheryl Bernard decided it was time to re-focus on curling, writing and fundraising. So she sold her agency to Western Union Insurance due to her wanting to focus on her passions and dreams. Cheryl Bernard is has a long list of curling accomplishments and awards. She was 43 when she won the silver medal as skip at the 2010 Vancouver Games. She is a four-time Alberta women’s champion, Canadian Runner-up, TSN Skins finalist and has maintained a top 5 status on the World Curling Tour for many years. Cheryl Bernard is now the president and chief executive officer of Canada’s Sports Hall of Fame where she looks forward to bringing the work ethic and leadership skills she learned in sport to her new position at Winsport’s Canada Olympic Park. Cheryl’s life changed when her father was given 6 months to live after being diagnosed with a brain tumor. Bernard was lucky to be able to devote most of her time to caring for her father and trying to find a cure. Sadly he passed away 2 years later. However, her father’s illness was the catalyst for her to create the annual “Curl for a Cure” in support of the Canadian Breast Cancer Foundation. Curl for a Cure helped raise over 1.3 million dollars in support of the CBCF. Bernard has been an ambassador for the Alberta Children’s Hospital, the Toronto Sick Kids Hospital, Children’s Miracle Network, Dairy Queen, Miracle Treat Day, Goodwill Industries of Alberta, and World Vision Canada. She has also been the official spokesperson for the 2010 “Terry Fox Run”. Cheryl Bernard also co-authored Between the Sheets -Creating Curling Champions, which describes the mental side of the game of curling. Bernard just recently published the second edition of the book entitled The Silver Lining. Cheryl delivers practical solutions and insights from her careers throughout her presentation. As an Olympic Silver Medalist, she will tell her story of determination and dealing with high pressure situations. Bernard’s experience in business and sport has also seen her work as a corporate keynote speaker, sports ambassador and as a TSN broadcast analyst. As a result of her career accomplishments, charity work and her experiences, Cheryl brings a unique perspective to every event so that she can inspire and change individuals and organizations through her presentations. Cheryl Bernard is passionate in everything that she does. From working with Canadian charities, to empowering those who are lucky enough for Cheryl to have touched their lives, Cheryl Bernard always leaves a lasting impression. Cheryl’s achievements within sport and business, reflect the articulate, determined and selfless person she is on and off the Ice. Cheryl goes the extra mile for you by researching the desired learning outcomes of your event, your audience, and her presentation to draft a customized presentation for each event. 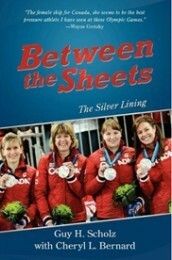 After taking home a silver medal at the 2010 Winter Olympics in Vancouver, BC, Cheryl L. Bernard presents her latest sports psychology book titled Between the Sheets: The Silver Lining. The newest edition of this inspirational sports psychology book combines poignant stories about Team Bernard’s emotional Olympic experience in their home country with valuable information about the mental, technical, and motivational aspects of this compelling team sport. “Our group really enjoyed Cheryl’s talk about her team’s Olympic experience and the preparation and discipline required to achieve her goal. Her talk was very engaging and inspiring. We were able to draw from her message and carry that theme through our company meetings and motivate our team to reach their own goals. Cheryl is a great presenter and we are lucky to have such a great ambassador for country and the sport of curling”. Cheryl entertained the audience with personal stories of her Olympic experience and the teamwork involved and provided many valuable lessons which can be applied to everyday life. She was engaging and professional. Cheryl’s presentation was well received and the evening concluded with a standing ovation and an impromptu rendition of the national anthem.